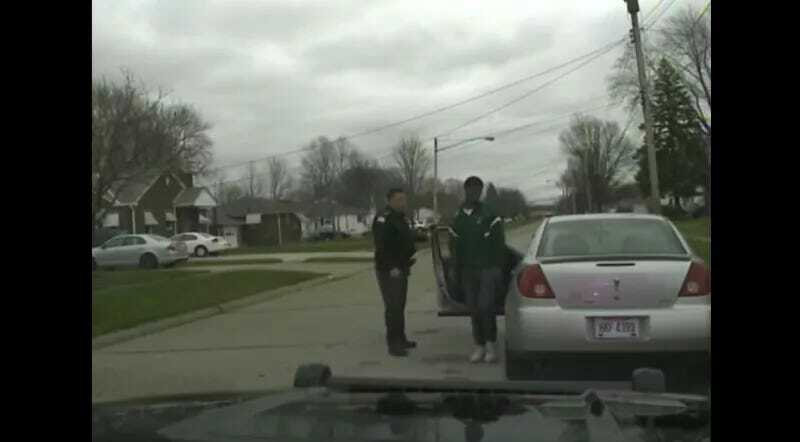 But that’s exactly what a Lorain, Ohio, police officer told his daughter’s black boyfriend when he pulled him over and threatened to take him to jail without any cause. John Kovach Jr. pulled over 18-year-old Makai Coleman on April 16, according to the Lorain Chronicle-Telegram (h/t the New York Daily News). Footage from Kovach’s dashcam shows him stopping Coleman and proceeding to come to the driver’s side door. After Kovach takes Coleman into the back of his squad car, he gets into an argument with Gloria Morales, a neighbor who had come out of her home nearby after seeing the police stop and whose two children were among those in Coleman’s car. Kovach was reportedly trying to find his daughter, who also was in the back seat of Coleman’s car, unbeknownst to Kovach. The officer tells Morales he wants to search her home for his daughter’s laptop. When Morales refuses, Kovach threatens to give her daughter a $300 ticket for not wearing a seat belt. When Morales says she’s going to call 911 on the officer, Kovach counters by threatening to take her to jail for calling 911 for a nonemergency. After he tells Morales’ two children to get out of the car and join their mother, Kovach finally notices his daughter, Katlyn, in the back seat. “Get in my car,” Kovach demands. Katlyn slumps off to the back of her father’s squad car as he gives Coleman the boot. The father and daughter can be heard arguing with each other on the dashcam footage before he drives away. The entire time this is happening, Kovach had actually been called to do his actual job. Dispatch had called Kovach to a road rage incident, to which he didn’t respond. Kovach was fired in May after an internal investigation, which included a review of the video. He claimed to a supervising officer that he was concerned about his daughter’s relationship with Coleman. According to the Chronicle-Telegram, Kovach said he didn’t believe Coleman was a good person, citing the teen’s arrest for marijuana possession. Meanwhile, records show that Kovach repeatedly lied to his supervisors about the entire incident, including claiming that Coleman was speeding and driving recklessly, which footage showed he wasn’t. The Lorain Police Department called Kovach’s actions “gross misconduct” and “an abuse of police authority.” But Kovach isn’t taking the termination lying down and is contesting his dismissal, saying that the city violated his rights by firing him.